First off, this is not the absolute way to do this, it’s merely how I do things and if you want to do it my way to. I’m not saying it’s the right way or the best way but you may find some use in the tips I have. 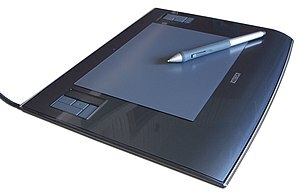 A graphic tablet. I am using a wacom Bamboo. Test out the colours you plan to use. Put them side by side to see how they will look if you plan to shade with them. The reason for this is to test the contrast of the colours. I generally chose the same colours every single time but even I need a reminder now and then. Sketch out what you plan to draw in the main colour you will be using, eg A skin tone if you are drawing a face, grey if you are drawing white hair etc. It also helps if you sketch out where you plan to shade or sketch in the main 3D areas you wish to accentuate. I did this with the cheeks and mouth area. Sketching like this makes it easier to paint over later. If you want a background colour then you should colour it first. If for some reason you change your mind at the last minute but it’s to late to go back, save your sketch with the save button at the bottom, choose either the lowest or no more than 50% opacity and colour over the top of your drawing without lifting your pen from your tablet. When you are ready to colour, start with the shadows and darkest parts first. Don’t worry if you do it to dark because you can always blend it in later. Use the lowest opacity to shade and slowly build up your shading. When you feel you are ready, start adding some lighting in the lowest opacity. Again, don’t worry if you do it to light because you can fix it the same way you can fix the shadows. Just finish off you lighting first, then darken it with low opacity. There are two ways to go about darkening and lighting. You can either build it up slowly with many strokes OR you can colour the area without lifting your pen. Really, you should leave your eyes until you have finished colouring your skin but that is only my opinion which I strongly recommend doing. The main reason I started it was to see how harsh the black was going to look against the skin tone which I then darkened a few times later. When you do get to the eyes, start with the whites of the eyes, the eye colour, eye shadow if you want to put eye shadow, THEN do the lashes LAST! Very important otherwise if you go over your skin or eyeshadows it will overlay the lashes and look silly. Add your lips in after you colour the skin to give a nice 3D plump shape. Don’t go over board with the light, just a few dots will do and for that extra 3D look, add some light around the top rim of the lips. Brake up the lighting though. Don’t fully follow the shape, just brake up the lighting a bit. You can see what I mean on the finished work in my previous post or when I zoom in in the video. Now on your tablet pen, it’s either left click or right click that brings up a pop up menu to zoom in or out. Use this as often as you need to. If you want the whole web page to zoom just go into your web browser settings and find the hot keys commands for zoom in and out. Do the same for hair and clothes, have patience but more importantly have fun and remember to save often! Unless you have a really awful net, just wait till you are done and save/post. Trust me, I saved and saved and on my second last save the net dropped out and I lost the whole picture where as if I had of waited I would have had it all posted and saved. Enjoy! Hope this has helped at least one person. Next Vlog isn’t going to be all that fancy. It will most likely be something I make on the spot. Sorry to say this, but the new video will be delayed. When I was a sentence away from finishing the video tutorial, Windows Live Movie Maker crashed. Three attempts later the same thing. Then it crash while saving so I am going to run repairs on it and anything else that is interfering and see how that goes. Very sorry for the delay but if I had anything better to work with then I would surely use it but this is all I’ve got to use for now. I know there are a few video’s on this already but to often I see people making tutorials without explaining anything, as if by merely seeing it in super high speed the audience is just expected to instantly understand the way you think and do things and why you chose that method as opposed to other ones. This is why I am making one, because I plan to talk out my whole thought process and reasoning behind my techniques. The lack of tutorials has motivated me to try my best to show and explain other ways you can make art with this unique blogging site. But I am going to do one using a different technique to the majority of users are using. Seasoned digital artists use the same technique I do but in saying that, it doesn’t mean your work will suddenly become epic in a matter of moments. It takes a lot of time and patience to reach the aesthetically pleasing look on Tegaki E. And even though it is slow process it truly does produce the best results. That should fix that annoying feature. MAKE SURE YOUR TABLET IS PLUGGED IN BEFORE TRYING TO CHANGE THESE SETTINGS! Otherwise it won’t work.